Great news for our parents for the 2018/2019 school year. 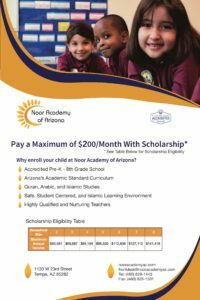 Scholarships are available at Noor Academy of Arizona. Enroll your child at Noor Academy of Arizona, KG students will be free tuition. Pay a maximum of $100 per month per child for scholarship eligible student (See maximum Annual Income Table below). Please visit our school to enroll your child. The school will be open for enrollment every Monday and Tuesday during the month of June and July 2018 from 8AM -2PM.